I have been experimenting with a small GPS module that was purchased from Amazon for about $25.00. It also available on eBay and from other vendors for nearly half the price. These units work well and can easily be interfaced to an Arduino. 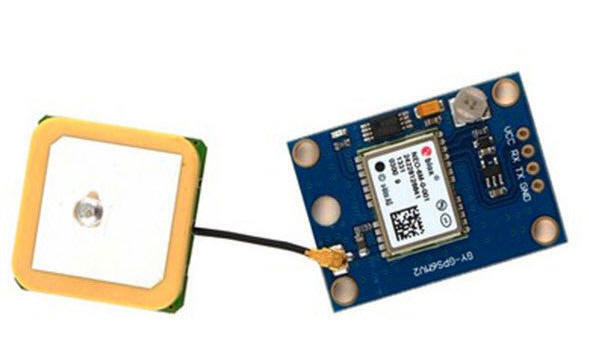 There are four connections to the GPS module, VCC (3-5 volts), ground, Transmit (TX) and Receive (RX). The TX and RX are standard serial signals. The default speed is 9600 baud. I have tested this module at both 3.7 and 5 volts. There is a 3.3 volt regulator on the board just under the "VCC RX TX" labels. RX and TX connect to the Arduino TX and RX pins, if hardware serial is being used, or to two other pins, determined in the software, if software serial is used. The program that I used for testing is available in the examples folder for TinyGPS++, a libray that you must install. Note that the RX and TX pins are swapped in this code and the baud rate has been changed from 4800 to 9600. The serial output on the Arduino terminal is shown here. Make sure that you change the baud rate on the terminal to 115200. The software below works well with the GPS unit and an LCD display - note that I had to reduce the baud rate of the GPS from 9600 to 4800 to avoid checksum errors. after changing to 4800 it asked if I wanted to write the change. There is an easy way to change the baud rate and update rate. Download and run Mini GPS and type Ctrl + Alt +S to bring up all the tabs. In Status select the appropriate Comport, select baud rate 9600 and click Open Now go to Setup, change the baud rate and update rate to what you want and click Set for both. I set the baud rate to 38400 and the Update Rate to 5 (updates per second) which are appropriate for Arducopter or MultiWii. I wanted to change the protocol from NMEA to UBLOX but could not see how to do this. So I had to set NMEA as the protocol in Arducopter. No problem.